Evolution In 1984 Mark Rossi purchased a small bar on the 200 block of Duval St. and changed the name to Rick's. Since that time the business has evolved into a huge complex consisting of six venues and 10 bars. With the acquisition of the sports bar next door the business became known as The Rick's/Durty Harry's Entertainment Complex! Today the complex features Rick's Upstairs, Key West's hottest dance club. 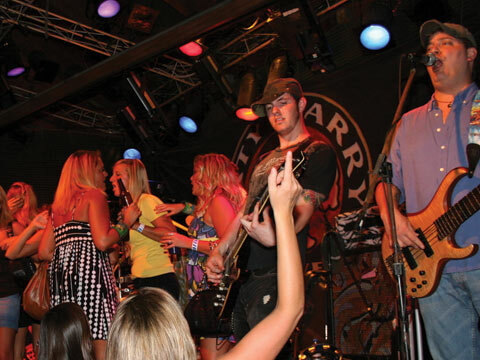 Durty Harry's, the best live rock & roll and sports bar in the keys. The Tree Bar gets its name from the huge shade tree providing customers with the most comfortable place to take in the sights and sounds of Duval St. This bar is best know for serving fresh squeezed juices and premium spirits. Rick's Down has the best live entertainment in town combined with the lowest priced and most potent drinks on Duval Street! The Crow's Nest is our brand new VIP Bar and deck. The bar was named for the bird's eye view it offers of the stage and courtyard. The sixth venue is our adult entertainment club, the Red Garter, which offers all that you would expect from the Key's premier facility. With all it has to offer, its no wonder that the Rick's/Durty Harry's Entertainment Complex plays a major role in most of the Festivals and Events in Key West. Each year we host Spring Break, the Sailfish World Championships, Lobster Fest, The Key West Poker Run, The World Offshore Championships and of course there was no bigger party during Fantasy Fest than Rick's. This past year the complex also hosted MTV, Wild On, The Travel Channel, ESPN and several other television shows. Each year Rick's strives to improve upon the last. Creating new events, increasing attendance at existing events and expanding its own walls. The evolution continues.